The parable of the Sower is found in the Gospels of Mark, Matthew, Luke and Thomas. I will examine the similarities and differences between the Gospels to uncover signs of editorial activity by the writers and their respective theological interests. I will also ascertain whether the allegorical interpretation is part of the original parable or added as a later tradition. Then, using a set of criteria for a genuine Jesus parable, I will reconstruct the original parable. The parables of Jesus are a unique element of Greco-Roman literature-they are not found in earlier Roman or Jewish sources. As the Jesus tradition grew, Jesus' parables were reinterpreted to address arising problems in the early Christian period (Funk pp.16-17). What are the marks of a genuine Jesus parable? Jesus used simple metaphors taken from nature that have a surprising twist and offer no conclusion but, instead, incite the hearer to ponder its application. Furthermore, the parables of Jesus display a distinctive plot structure, often with surprising role reversals (Funk pp. 17-18). Also, the parables of Jesus reveal features of an oral tradition-short terse sentences, minimal words and a simple plot structure comprised of pairs and sets of three. Other markers for the oral tradition include, concrete and dramatic imagery, not abstract concepts, as found in allegorical interpretation (Funk p. 17). By comparing the Sower parable found in the Synoptics, it is apparent that Mark, Matthew and Luke all use the same literary structure, which includes an introduction, the parable and the allegorical interpretation. The Gospel of Thomas is a much shorter account of the Sower parable and lacks the allegorical interpretation. Also, the Synoptics use similar language and place the parable comparatively in same narrative order, although Luke moves his narrative on Jesus' true relatives from before to after the Sower. (Funk p.8). Furthermore, we find agreeing similarities between Mark, Matthew, Luke and Thomas. All four Gospels maintain the simple narrative logic of planting, growing and harvesting, and use the same metaphorical structure of a sower sowing seeds along the path, among the rocks and thorns, and good soil, suggesting these elements make up the original structure of the parable (Scott p.362). The allegorical part of the parable is more problematic. Only Synoptic versions of the parable have an allegorical interpretation. Those who defend the allegory as part of the original text argue two points: 1) the Sower parable focuses heavily on the metaphorical process of sowing rather than identifying with the interactions of characters as seen in other parables thus, begging the question of what does parable stand for and hence the allegorical answer (Scott p. 345). The Gospel of Thomas has no allegorical traits. With no independent attestation supporting the allegory as part of the original structure, and by using our criteria for an authentic Jesus parable, the allegorical nature of the Synoptics contradicts some significant oral tradition markers. An authentic Jesus parable is a metaphor or simile (Funk p. 16). But, the Sower's allegorical interpretation presents abstract notions about what type of person hears the "word". Also, Jesus parables have no conclusion. Rather they tease and provoke the listener. Jesus never explains what the parable means or how it is to be understood (Funk p.17). The allegorical interpretation explicitly tells us how the parable is to be understood. Furthermore, the allegorical interpretation uses the word "logos" for gospel and "sowing" symbolizing preaching which strongly suggests a Christian vocabulary (Scott p. 344). Lastly, the allegory seems out of order with the parable. If the metaphoric seed represents the "word" sown, why then does the allegorical crop refer to the different types of hearers? It suggests that the early Christian community added the allegory to reflect various failures of the second or perhaps third generation Christian preaching (Funk p. 59). Moreover, Synoptic analysis of the allegorical interpretation exposes the theological interests of the gospel writers. Both, Mark and Matthew use the parable of the Sower to introduce an extended discourse. Mark emphasizes hearing and accepting the word. The allegorical interpretation represents part of Jesus' secret teaching, a dominant theme in the Gospel of Mark (Scott p. 347). Mark also underscores the seed that fails to produce as cautionary note to the Christian community which emphasizes the ramifications of not hearing the word (Scott p. 350). Matthew 13:18-19 and 22-23 emphasizes hearing and understanding the over-arching theme-the kingdom of God (Scott p. 348). Luke uses the parable as an illustration for hearing the gospel as highlighted in Luke 8:15 (Scott 349). Lastly, the Gospel of Thomas, as an independent source, suggests the parable probably circulated in the oral tradition without elaboration or an allegorical interpretation (Scott p. 344). Therefore, based on these arguments, I submit that the allegorical interpretation was added as a secondary layer and offered as a intrepretative conclusion to serve the particular interests of the evangelists (Funk p. 18). The similarities between the Synoptic text and the Gospel of Thomas displays a paratactic construction and a repeating threefold structure of the main verbs. In Mark 4:4, the author uses "seed fell / birds came / ate it" and similarly, in Thomas 9, "some fell / birds came / gathered them up". This repeating pattern of three appears throughout the different versions of parable suggesting that the idiom of this Jesus parable was comprised of short, clipped sentences organized in a threefold structure (Crossan p. 43). Furthermore, the repetitive pattern of the initial verb, "fell" is typical of the oral tradition (Scott p. 351). Examining Mark 4:3-4, Matthew 13:3-4 and Luke 8:5 we find almost word for word agreement. There are minor differences in Matthew, which uses the plural of "seeds" throughout parable, whereas, the texts of Mark and Luke cling to the singular. Also, Luke 8:5 adds the word "his" seed and expands the image of the seed falling to the path with an additional phrase, "and was trodden under foot". Because there is no independent agreement for this variation, and noting that it breaks the triadic structure, it suggests a Lukan insertion. An analysis of the opening in Thomas 9:1 displays a stronger threefold structure, whereas the Synoptics have used a bridge, "And as he sowed," as its third component of the triad (Scott p. 352). There appears strong agreement between Mark and Thomas, but using our criteria for a genuine Jesus parable, I hypothesize that Thomas 9:1-2 has the most signifying marks of an oral tradition-a compressed, lean, threefold structure suggesting it is the more authentic version of the parable (Funk p. 17). In the next segment of the parable-the seed sown on rock, Mark 4:5-6 instantly stands out as being the longest section in the entire parable which repeats the metaphor of lack of ground three times. Moreover, the Markan author presents a visual discord of a seed that does not survive the sun's scorching heat and a seed that grows for a time, but then withers (Crossan p. 40). Mark's insertion of the sun infers difficult circumstances within the Markan community. This notion is further illuminated in Mark 4:16-17 with his allegorical interpretation that a scorching tribulation and persecution will arise (Crossan p. 42). Matthew 13:5-6 responds by simply agreeing with Mark 4:5-6. However, Luke 8:6 compresses this passage, removing the redundant lack of ground and the inclusion of the sun, returning this section of the parable to a shorter, more pre-Markan version (Crossan p.40). Luke's use of "no moisture" suggests an obvious addition since it inserts a fourth element to the triadic structure of fell/grew/withered. Thomas 9:3 is clipped and direct and displays the least amount of editorial activity, thus suggesting it is the more original version because it preserves the terse threefold sentence structure that is indicative of the oral tradition (Scott p. 351). In the section of the seed sown among thorns, we find minor textual differences. Matthew 13:7 agrees with Mark 4:7 who incidentally breaks the threefold pattern with the inclusion of, "and it yielded no grain." Both Thomas and Luke maintain the triad structure. The phrase, "and worms ate them" in the Thomas version suggests an alternative performance concerning the harvest. In the Synoptics it is thorns, whereas Thomas opts for worms (Scott p. 354). I suggest that Luke 8:7 is more representative of the original parable because it deletes the phrase, "and it yielded no grain" thus, minimizing the word count and preserving the triadic structure (Scott p. 351). The parable closes with the seed finding good soil and yielding a successful harvest. Mark 4:8 uses a double threefold structure: seeds fell/good soil/forth grain/ and yielding 30/60/100. This structure suggests not a fourfold emphasis, but a contrast of the three fields of failure versus the three successful harvests of the one good field (Crossan p.41). In our attempt to reconstruct the original parable, the words, "growing up and increasing" are redundant; this has been recognized by both Matthew and Luke by their elimination of this phrase. Furthermore, Matthew 13:8 reverses the threefold yield in descending order, whereas Luke 8:8 simply emphasizes the one hundredfold yield. Both approaches place the emphasis on the larger number. Thomas 9:5 closes with doubling the yield (60/120). Mark's triple ending suggests the more original ending because it makes for distinctive poetry. Poetry often employs the terminal modification of a formal principle in poetic closure. Mark's consistent use of the triadic structure is broken by his terminal ending of 100, signifying the parable's ending (Crossan p. 43-44). This would suggest that Mark 4:8, less the "growing up and increasing" insertion, is closer in structure to the original version of the parable than Thomas's doublet version. Thus, based on our analysis of Mark, Matthew, Luke and Thomas, we now have a basis to assemble a proposed reconstruction of the Sower parable. It would read: Thomas 9:1Now, the sower went out, took a handful of seeds and scattered them. Thomas 9:2Some fell on the path; the birds came and devoured them.Thomas 9:3 Others fell on rock, did not take root in the soil, and did not produce. Luke 5:7And some fell among thorns; and the thorns grew with it and choked them. Mark4:8And other seeds fell into good soil and brought forth grain and yielding thirtyfold and sixtyfold and a hundredfold. 1973 In parables: The challenge of the historical Jesus. New York: Harper & Row. Funk, Robert, Scott, Bernard Brandon and Butts, James. 1988 The Parables of Jesus: Red Letter Edition, Sonoma: Polebridge Press. 1989 Hear then the Parable: A commentary on the parables of Jesus. Minneapolis: Fortress Press. 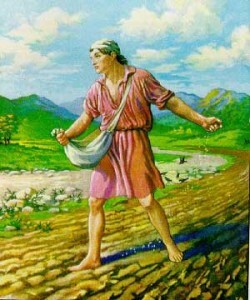 3 A sower went out to sow.4 And as he sowed, some seed fell along the path, and the birds came and devoured it. 3 A sower went out to sow.4 And as he sowed, some seeds fell along the path, and the birds came and devoured them. 5 A sower went out to sow his seed; and as he sowed, some fell along the path, and was trodden under foot and the birds of the air devoured it. 1 Now the sower went out, took a handful (of seeds), and scattered them.2 Some fell on the road; the birds came and gathered them up. 5 Other seed fell on rocky ground, where it had not much soil, and immediately it sprang up, since it had no depth of soil, 6and when the sun rose it was scorched, and since it had no root it withered away. 5 Other seeds fell on rocky ground, where they had not much soil, and immediately it sprang up, since it had no depth of soil, 6but when the sun rose they were scorched, and since they had no root they withered away. 6 And some fell on the rock; and as it grew up, it withered away, because it had no moisture. 3 Others fell on rock, did not take root in the soil, and did not produce ears. 7 Other seed fell among thorns and the thorns grew up and choked it, and it yielded no grain. 7 Other seeds fell among thorns and the thorns grew up and choked it, and it yielded no grain. 7 And some fell among thorns; and the thorns grew with it and choked it. 4 And others fell on thorns; they choked the seed(s) and worms ate them. 8 And other seeds fell into good soil and brought forth grain, growing up and increasing and yielding thirty-fold and sixtyfold and a hundredfold. 8 Other seeds fell into good soil and brought forth grain, some a hundredfold, some sixty, some thirty. 8 And some fell into good soil and grew, and yielded a hundredfold. 5 And others fell on the good soil and produced good fruit; it bore sixty per measure and a hundred and twenty per measure. 14 The sower sows the word 18 Hear then the parable of the sower. 11 Now the parable is this: The seed is the word of God. 15 And these are the ones along the path, where the word is sown; when they hear, Satan immediately comes and takes away the word which is sown in them. 19 When any one hears the word of the kingdom and does not understand it, the evil one comes and snatches away what is sown in his heart; this is what was sown along the path. 12 The ones along the path are those who have heard; then the devil comes and takes away the word from their hearts, that they may not believe and be saved. 16 And these in like manner are the ones sown upon rocky ground, who, when they hear the word, immediately receive it with joy; 17 and they have no root in themselves, but endure for a while; then, when tribulation or persecution arises on account of the work, immediately they fall way. 20 As for what was sown on rocky ground, this is he who hears the word and immediately receives it with joy; 21 yet he has no root in himself, but endures for a while, and when tribulation or persecution arises on account of the word, immediately he falls way. 13 And the ones on the rock, are those who, when they hear they word, receive it with joy; but these have not root, they believe for a while and in time of temptation fall away. 18 And others are the ones sown among thorns; they are those who hear the word, 19but the cares of the world, and the delight in riches, and the desire for other things, enter in and choke the word, and it proves unfruitful. 22 As for what was sown among thorns; this is he who hears the word, but the cares of the world and the delight in riches choke the word, and it proves unfruitful. 14 And as for what fell among the thorns, they are those who hear, but as they go on their way they are choked by the cares and riches and pleasures of life, and their fruit does not mature. 20 But those that were sown upon the good soil are the ones who hear the word and accept it and bear fruit, thirtyfold and sixtyfold and a hundredfold. 23 As for what was sown on good soil, this is he who hears the word and understands it; he indeed bears fruit, and yields, in on case a hundredfold, in another sixty, and in another thirty. 15 And as for that in the good soil, they are those who, hearing the word, hold it fast in an honest and good heart, and bring forth fruit with patience.